In July, 2002 I took a trip to Utah, stopped in Cedar City to see Shakespeare's Julius Caesar. We had a celestial event just after the Assassination, when Mark Antony holding up the body, says "Passion, I see is catching; for mine eyes, Seeing those beads of sorrow stand in thine, Began to water" the sky opened and the rain came so hard they had to stop the show a few minutes before the intermission. It didn't rain any more that night, but as I continued to Dinosaur National Monument the rain continued on and off for the whole trip. There is a magnificent Dinosaur Museum there with skeletons and other exhibits. The sky was dark and threatening most of the time I was there, but I did manage to do this painting on scene. It was spooky, as the whole place reeked of the Dinosaur, and I could almost feel their spirits. Between the trees, branches, rocky hillside, and the cold dark, cloudy sky, that is what I tried to capture here at Dinosaur National Monument. 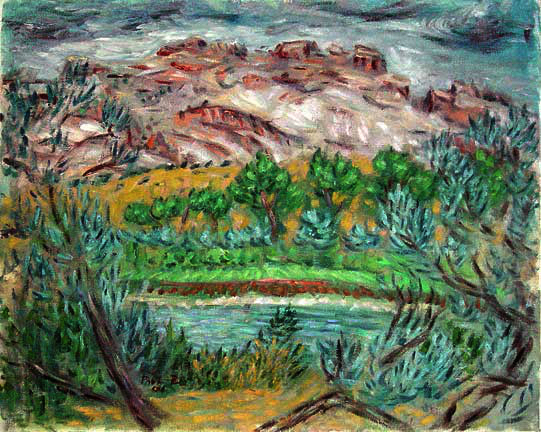 PaulB's Pointillistic/Impressionist original oil paintings of Dinosaur National Monument and various prints and poster formats of a wide variety of subject matter by the Pointillistic/Impressionist oil painter from landscape/waterscape paintings, dance, sports, portrait, to classical figures, flowers, rock and roll, Brazil, and Hawaii paintings and prints are available for purchase for as little as $24.95 for an 8" x "x 10" matted print on photo pape. Pointillistic/Impressionist Giclee prints of National Monument on real canvas or heavy watercolor paper are available. One of a kind Dinosaur National Monument embellished prints, which are Giclee prints retouched in genuine oil paint by PaulB. Unless noted PaulB's original Pointillistic/Impressionist oil paintiings are oil on canvas. Paul Berenson's pointillistic/Impressionist oil paintings are in privale collections around the world, including the downtown Los Angeles Athletic Club and have appeared in numerous publications, including the New York Philharmonic Playbill. PaulB.com also builds websites and PaulB is a member of the LA Web Professionals Group.